Adventures in the Endless Pursuit of Entertainment: Happy Birthday Kate Baldwin: a new baby and a new album! Happy Birthday Kate Baldwin: a new baby and a new album! 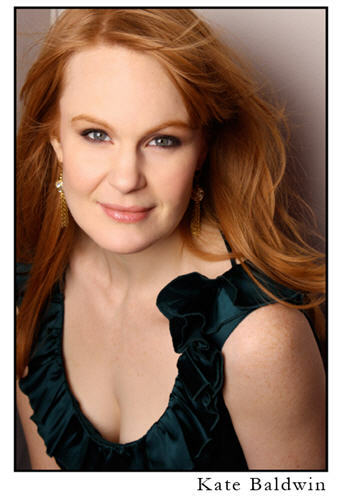 Today is Kate Baldwin's birthday! I think this is a pretty good birthday year for her; she and her husband Graham Rowat are new parents to Colin, born on April 19th, and she has a new album being released! In March, Kate appeared at Feinstein's at the Regency in a week long gig titled "She Loves Him." The set was comprised of the music of Sheldon Harnick, the Tony and Pulitzer winning lyricist of Fiorello, She Loves Me, Fiddler on the Roof, The Apple Tree, etc. Mr. Harnick joined her on stage for the second half of her show and blew us away. Fortunately, for all of us who where there, and those who weren't lucky enough to be there, the set was recorded live and will be released by PS Classics in July - which is a birthday present for me! I have a confession to make: I have never seen any of Sheldon Harnick's shows. However, I have the original cast albums and I've seen Mr. Harnick perform on a number of occassions - Wall to Wall Sondheim, Wall to Wall Broadway, and finally at Kate's show at Feinstein's. He is nothing less than charming and the perfect match to delightful Kate Baldwin. The show, directed by Diana Basmajian was pure joy, just like Kate. To borrow a phrase, Kate is "easy, breezy and beautiful," both in presence and voice. I've been a fan since I saw her in the Sondheim revue Opening Doors at Zankel Hall in 2004. She has the kind of vocal versatility that is thrilling - one song will be light and pretty or funny, the next is soaring soprano. I truly believe there is nothing she can't do. I'm anxiously awaiting to hear what is next for Kate, but for now, I'm very excited to wait for this album She Loves Me.